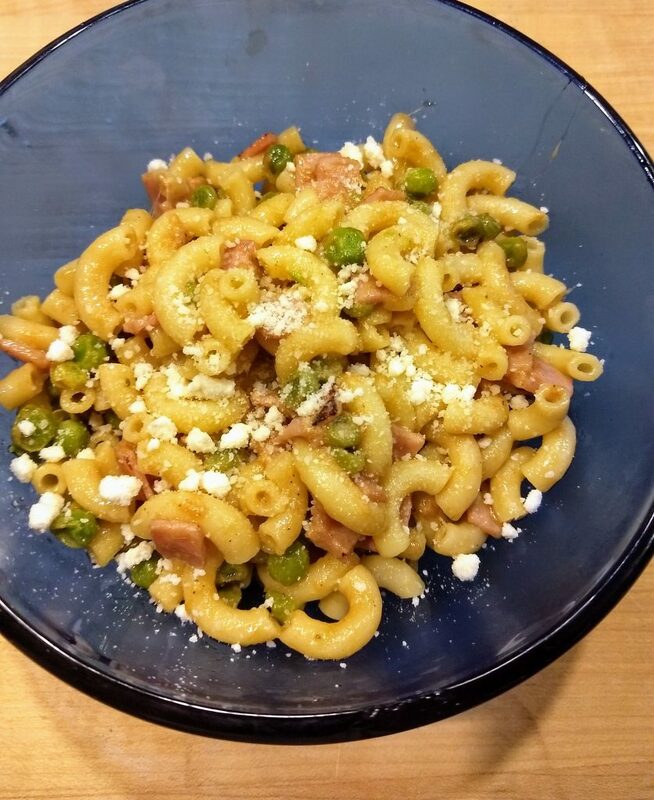 Tonight was another busy night, so I made this Creamy Lemon Pasta with Peas and Ham. Basically, you cook up some pasta, and toss some frozen peas into the pot near the end (after first removing a cup of the pasta water for the sauce). Meanwhile you toast minced garlic and red pepper flakes in oil, then add in the zest and juice of one lemon, along with the pasta water, and a little bit of cream, and let that reduce. If you want to add ham (which we thought was an excellent addition), you mince that up and toss it in a separate pan to brown, and then at the end, you stir everything together with some parmesan and serve. The recipe calls for orecchiette pasta, but I used mini elbows because that’s what was in the cupboard. Plus I inadvertently toasted the garlic a little too far, so I ended up straining the sauce prior to thickening it, to remove the charred bits (oops). But despite that little mishap, it turned out quite tasty. This is one we’ll definitely make again, although next time I will significantly decrease the amount of olive oil used, since it was a little on the greasy side.